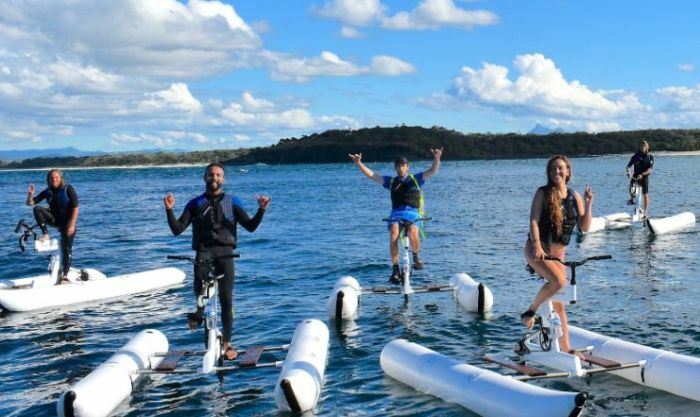 If you love the outdoors and water activities, then you may want to visit the newly-opened Cape Town Water Bikes for some fun adventure. The Simon's Town business is the first company in South Africa to introduce water bikes to the market. The bikes are silent, environmentally friendly and easy to steer, explains founder Ros Potgieter. No previous cycling experience is needed. The bikes are mounted on two four-metre-long pontoons. It gives a very stable and elevated platform. It's literally a bicycle on the water... You hop on, pedal, and off you go! Simon's Town has become a great water activity hub. Potgieter has imported 14 water bikes which are all in operation so far and says the business could expand in the future. Visitors can choose between a two-hour tour guided tour to the famous African penguin colony at Boulders Beach or self-guided rentals for 30 minutes or one hour in Simon's Town Bay. A safety boat, lifejackets and emergency radios are included in all trips. Visit the Cape Town Water Bikes website for more.